At Big River Bindery we practice the art of the book: conserving and repairing books and paper items, making custom books and boxes for special occasions, and printing books and ephemera with custom designs using letterpress printing. We use vintage wood and metal type and antique presses and bookbinding equipment, some over 100 years old. Visitors are welcome to drop by during our open hours and by appointment. 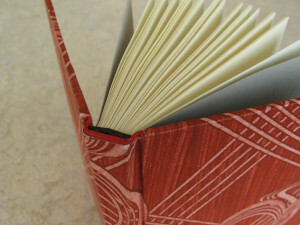 Workshops in letterpress printing and the book arts are listed under our Workshop tab. We are open Monday 10 to 1, Tuesday and Thursday 10 to 4, and by appointment. Call or email to find a time that works best for you. Sign up for email notices of events and classes.